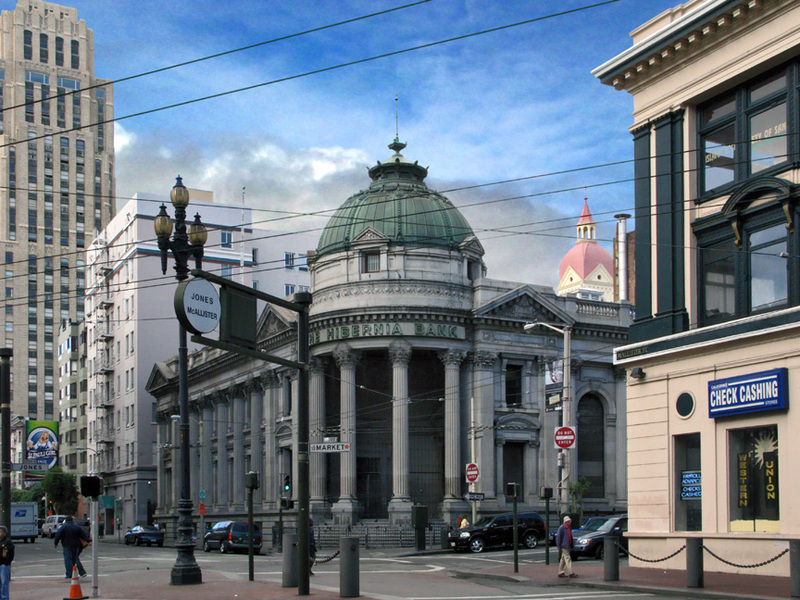 Indeed, so famous was the building and so beloved by San Franciscans that they called it “The Paragon.” The Hibernia Bank was one of the few buildings in the central city to survive the 1906 cataclysm, although it was damaged by the fire. As one of the City’s most popular and vital institutions, it was also one of the very first buildings to be restored. Fire-damaged Hibernia Bank, 1906. When this photo was taken, restoration of the bank building had just begun. The original copper dome had melted in the intense heat of the fire. Great coverage of the Hibernia Bank! I am doing a historical podcast and multimedia piece about the building for the San Francisco Arts Commission. I would love to interview you about your experience documenting the area. I can’t find your contact information. If you email me, I will send you info about the project. Thanks, Pauline. I’ll send you an email in the morning.